As a teenager I was frequently told that I look like my paternal grandmother. I would scowl every time I heard it said. Ruby, the granny I knew was 90 in the shade; had warts and moles, was grey, and worse, was FAT. Not morbidly obese, which is what I quickly became, but overweight enough for me to think the comparison ended there. I HATED the implied criticism. I had these pictures reframed. The one of her, taken with my grandfather, hangs in pride of place on my lounge wall. For years, in idle moments, I would look at that picture and hear my mom say you look like your granny and sigh. Because I didn’t and wouldn’t, not like THAT, not ever. I was an overweight teen. A tubby adult. And by the time I was 30, the concept of thin was no longer part of who I thought I could be. Me, a ruby? More a lump of coal. With the emphasis on LUMP. Having heard about the Tim Noakes diet I decided I’d give it a try. I didn’t really expect much. Over the years I’d tried all sorts of diets. On some I’d shed a little bit of weight. But they never lasted and I would find myself either obsessing about how much food I could eat and what I could not – or more often, give up, after the first few days. I expected this one to turn out pretty much the same way. Snacking was allowed while I broke my addiction to carbohydrates. I took that as gospel and stuffed my face on salami and avocadoes and cream. Drank copious full-cream cafe lattes. Ate blue cheese and bacon bits like there was no tomorrow. Scoffed nuts and cherry tomatoes at every opportunity. Come time for the first weigh in ten days into the diet and I was convinced the scale would show a weight gain, and then some. Boy, was I wrong. I almost fell off the scale on that Friday morning. I had dropped 6.3 kilograms. And without starving myself, or obsessing about food, or feeling grouchy and deprived??! That was 17 January 2014. 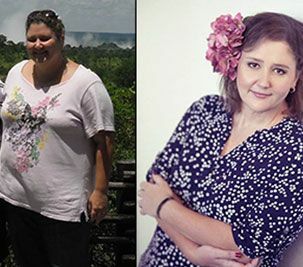 In September 2014 I hit a major milestone 50 kilograms gone. Then already the best part for me was being able to sit on a plastic pool chair without worrying it would collapse beneath me. Being able to wrap a towel around me – with towel to spare. Being able to sit with colleagues on a plane when travelling on business. Previously I had to ask for an extender belt and was always to embarrassed to have anyone I know see. Buying clothing in shops where the range ends at a size 16, rather than starting at 16. Not having everything I wore being a shapeless tent I’m down from a 28 to a 16 in shirt size, and am making excellent progress at getting to the same in pant size. I discovered I had curves in all the right places, curves, and collar bones, which for years had been hidden beneath layers of fat! Going from being diabetic with a fasting glucose of 18 in 2013 to 6.4 in June and now, 5.4. Effectively no longer diabetic. My blood pressure also took a tumble, from an average of 120/80 to 100/ 70. Even when I am stressed! My cholesterol is a healthy 4.0. This morning – 8 October 2014 – my scale has confirmed again in little red digits that I am FINALLY no longer part of the 100s club. I’ve lost over 50kg since January and for the first time in 13 years am at a weight that is recorded in double – not triple – digits. I’m stronger, leaner and in better health now, than I have been since at least my matric year – way back in 1993. I’m not done I want to lose another 15kg, but for the first time in forever – I can look in the mirror and say I am fabulous – and believe it. For the first time in nearly two decades more than half my lifetime I know I CAN be a ruby, too. I’m a banter for life. Tim Noakes is my hero. Thank you.